In last week’s Points of Interest, host Rubi Bayer and Game Designer Robert Gee took viewers on a skill-by-skill tour of the first elite specialization announced for Guild Wars 2: Heart of Thorns™—the mesmer’s chronomancer. One of the chronomancer’s central themes is the idea of taking from your enemies to benefit your friends. In terms of actual gameplay mechanics, this means that the chronomancer’s party support will be based around controlling, slowing, and hindering enemies just as much as aiding and invigorating allies. For example, the Well of Recall will pulse alacrity to allies in its radius and speed up their recharges, and then on its final pulse, it will chill enemies, slowing their skill recharges. Chronomancer wells are planned to last for three seconds with a total of four pulses. Typically, there will be a special end effect on the final pulse; for the straightforward Well of Calamity, this means that the first pulses inflict some moderate damage and a couple of conditions, and the final pulse delivers a large spike of damage. Similarly, the healing Well of Eternity will grant the chronomancer a small self-heal, pulse vigor to allies, and then put out a final heal to all allies in its radius on its final pulse—it won’t help you out during focused spike damage, but the payoff is a significant group heal. The elite Gravity Well, in its current iteration, grants stability to allies while putting hard controls on foes, pulling them into its center and ending (for now, although this may be changed for balance) by reversing gravity and causing enemies to briefly float. 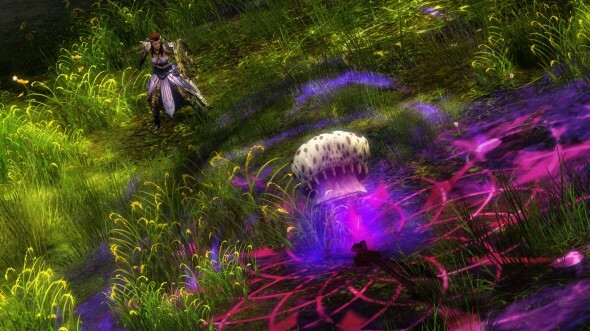 Alacrity, the new effect that increases skill recharge by 66%, is another central core of the specialization. Only chronomancers will have access to alacrity, although they’ll be able to share it with allies by using skills like the Well of Recall. While alacrity can’t be affected by boon duration bonuses, it can be modified through some of the chronomancer’s traits, like one that grants alacrity every time a chronomancer shatters an illusion. Using a shield, the chronomancer’s new off-hand weapon, you’ll gain access to two new skills—Echo of Memory and Tides of Time. Each skill has straightforward benefits—like blocking an attack or granting quickness to allies—but also has room for high-skill play; a chronomancer could use Echo of Memory to block an attack and gain a phantasm as well as access to a second blocking skill. A chronomancer who just sent the Tides of Time racing toward their enemies could catch the returning wave and shorten the skill’s cooldown. In addition to the new Illusionary Chronomancer phantasm, chronomancers will have other opportunities for fun with illusions. Try equipping the Illusionary Reversion trait to get a free clone every time you shatter an illusion, or the grandmaster Chronophantasma trait to gain the ability to shatter each phantasm twice before losing it. Layer all these skill effects together, throw in the added complexity of moving through time with the Continuum Shift shatter effect, and the chronomancer is perfectly poised to wreak havoc on its opponents. Fittingly, as Robert points out, the chronomancer’s history is one that stretches back to the time of the original Guild Wars and the Utopia campaign. You can learn more about the origins of the chronomancer in last week’s Hidden Arcana or visit the chronomancer blog post to read the announcement of the elite specialization. To see the chronomancer in action for yourself, you can watch the livestream recording below. Check it out, and feel free to visit the official Guild Wars 2 forums to chat with other time-bending enthusiasts!